Blogger is a vast blogging platform with millions of blogs hosted on it. So some time before Blogger introduced Country Specific Redirection. For example a visitor from India who visits your blog by entering the URL abc.blogspot.com will be redirected to abc.blogspot.in. Blogger introduced Country Specific URL to provide better support to local blogs. Today I am going to show you how you can stop this redirection. Before that you must be wondering that why should you stop redirection. The answer is simple. After redirection is on, you lost your Alexa ranks and the Pagerank juice too. This is not healthy for your blogger blog. So to remove the Redirection follow the steps given below. After adding the code save the template. You are done now. Now whenever a person tries to visit your blog, inspite of being redirected he will be at the original blog URL. This would help me in increasing alexa rank and page rank or vice versa ? admin there's a typo in ur post : "After redirection is on, you "lost" your Alexa ranks and the Pagerank juice too." I tried to change .blogspot.com/ncr for the complete url of my blog but still not working, what I'm doing wrong? great script my friend....and very usefull !!! i have it many months ago, and it works perfect !!! I'm a blogger at Blogging Easier with a background in technology and programing. 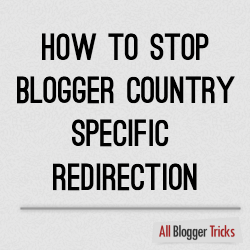 I have some queries regarding this trick to stop blogger country specific redirection. I have used the above trick on my blog, will it effect my SEO. Will I'll loose all SEO juice if I'll remove it now from my blog?